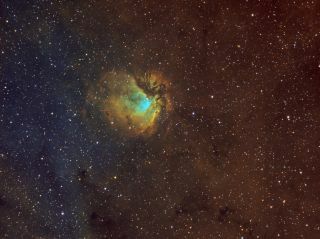 Bill Snyder captured Sh2-112 Sharpless on July 29, 2012 from his home observatory in Connellsville, Pa. He used a TMB130mm telescope equipped with an Apogee U8300 camera, as well as an Atlas EQG mount and several filters to view SH2-112. The total exposure time to capture this image was more than 18 hours. A veteran stargazer and photographer captured this spectacular image of emission nebula Sh2-112 Sharpless. Astrophotographer Bill Snyder captured this image from his home observatory in Connellsville Pa. Snyder used a TMB130mm telescope equipped with an Apogee U8300 camera, as well as an Atlas EQG mount and several filters to view SH2-112. The total exposure time to capture this image was more than 18 hours during a July 29 observing session. Sharpless 2-112, also called LBN 337, is an emission nebula about 5,600 light-years from Earth in the constellation Cygnus. The red glow is caused by the bright star BD+45 3216, which is about 30 times larger than our own sun. The star is so bright it releases light mostly in the ultraviolet range.